One of my favorite features of the new universal version of OmniFocus is the ability to customize the Today view widget. Previously, it would only show you items that were due today. You can now customize it to show you more relevant information, such as Due Today, Deferred Until Today or Due Today, and you can also use a Custom Perspective (only available with the Pro upgrade). 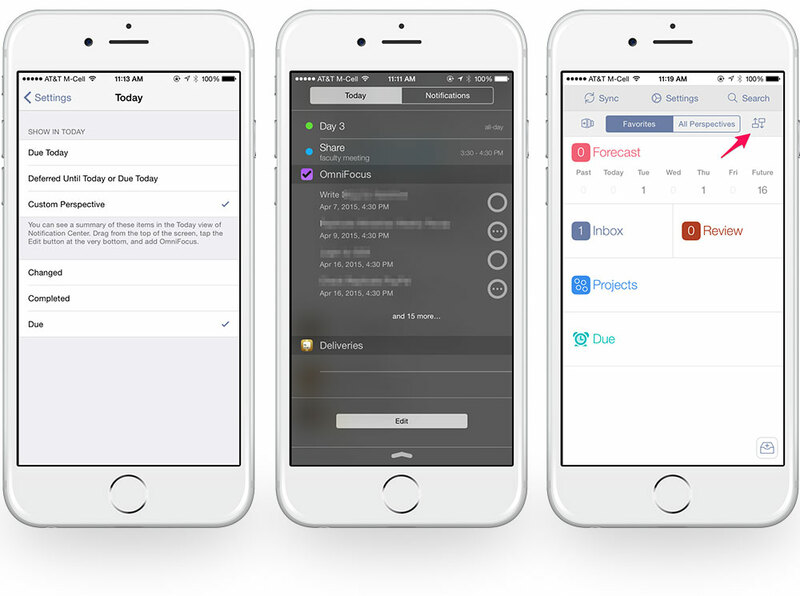 To customize the Today view Widget, go to OmniFocus Settings → Notifications/Today. My preferred option is to use a Custom Perspective to show a short list of my upcoming Due items regardless of if they are available today or not. This gives me an idea of what sort of week I am going to have. By combining the power of Custom Perspectives with the Today view widget, you can get quick visibility into your GTD system. This version of OmniFocus also allows you to re-order the home screen to only show the sections that you want to see. I don’t use Flags or Location-based reminders (I use Reminders.app for those), so I can completely hide those sections. Don’t forget to check out our review of the OmniFocus ecosystem to learn why it’s our favorite GTD and productivity suite for iOS and Mac. If you are still using the iPhone only version of OmniFocus, you can upgrade to the new universal version at a special discount.